This is a 8 piece layout template set for a LP Guitar. This template has everything to complete a finished instrument. MADE FROM 1/4" MDF. THEY ARE TAPED OR SCREWED DOWN TO THE BLANK AND ROUTED TO SHAPE. IMPORTANT: all of our instrument templates are an interpretation by GPC All templates have been drawn by GPC and are a representation of familiar instruments. We do not represent that the instruments are to any manufacturer specifications. 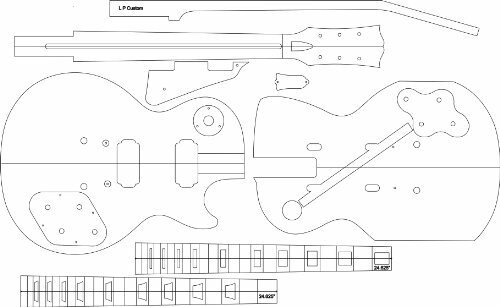 These templates are intended to help instrument builders make instruments with similar appearances. We do not guarantee sound or measurements from our templates. Our Templates will allow a complete instrument to be built using our guides and given the builder has the necessary skills to complete an instrument. Similar names have been used to make finding templates easier. If you have any questions about this product by GPC, contact us by completing and submitting the form below. If you are looking for a specif part number, please include it with your message.